New!! Gnarly Pine Cabin - 2BR,2Bath 4 miles from Deadwood! Private lot on 11 acres! Property Size 1,070 sq. 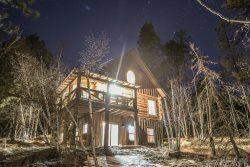 ft.
Gnarly Pine is a new custom built cabin on 11 acres just 4 miles from Deadwood! There are 2 bedrooms, each with a queen bed and both have an adjoining full bathroom. With a full size memory foam pullout in the living area, you can sleep up to 6 guests comfortably. This 1070 square foot cabin has expansive 16 foot pine ceilings, a gas fireplace, granite counter tops, two covered decks with comfortable furniture and a propane fire pit, custom log beds and a dining table made from a tree from Gnarly Pine property! There is wi-fi and a smart TV, Kuerig and Regular coffee maker, and a Traeger Grill for guests to use. You won’t want to leave this impressive cabin! Gnarly Pine is the perfect peaceful hideaway to relax and unwind if you need to recharge but still close enough to Deadwood and other area attractions if you need a little excitement. 1/2 mile of gravel and parking for 2-3 vehicles. 10 miles from Terry Peak, 4 miles to Deadwood. You can ride snowmobiles/atvs directly to/from this home by riding down the road 1/2 mile and getting on the trails across the highway. 4WD/AWD is necessary in snowy months.